In a Nutshell: The idealized model for merging retail’s online and offline worlds has long involved the digital wallet, where customers could store payment information in one place and seamlessly shop with any retailer, across devices and in person, without ever swiping or signing. Amazon is helping bring the digital wallet dream to fruition with Amazon Pay, which allows users to make online and mobile purchases using their Amazon credentials on thousands of merchant sites and apps. The online giant, named #1 in customer satisfaction and corporate reputation, has already seen more than 33 million Amazon Pay users, and Amazon Pay sales volume nearly doubled in 2016 alone as merchant growth rose by 120%. With more of Amazon’s hundreds of millions of existing users flocking to Amazon Pay every day, the retail giant shows no sign of slowing down as it makes its mark on the payments space. Though few may realize it, the digital wallet has been around, in one iteration or another, for roughly 25 years. The earliest versions, often called “electronic wallets,” were PC-bound software programs built during the initial boom of online shopping. The programs were designed to make shopping online more convenient by storing credit card information on your computer that could then be used to auto-fill the payments fields on retail websites, eliminating the need to enter account information to make a purchase. The first electronic wallets were, sadly, as short-lived as the dot.com boom itself, in large part due to the relative obscurity of their creators; few people wanted to trust their financial information to an unknown company. Several years later, a number of major credit card issuers, including giants VISA and MasterCard, each gave the electronic wallet a go. Unfortunately, these proprietary programs were limited in their use, functioning only on select sites and with only their branded credit cards, so the technology never became very popular in the mainstream. That said, the digital storage of payment information has taken on yet another iteration over the last 10 years — this one significantly more successful than its forebearers. Commonly given the moniker of “mobile wallet,” the latest technology has seen greater adoption than any of its predecessors, mostly due to the fact that 79% of Americans now shop online — and just over half of them use their mobile phones to do it. Additionally, the new mobile wallets are significantly more versatile, with a single program — or mobile application — able to store and use credit card information from a variety of issuers and banks. While Google is generally credited with the first (successful) modern mobile wallet, many major technology companies weren’t far behind in developing their own versions, and all of them have been evolving the technology regularly over the years. In particular, Samsung and Apple have both been quick to adopt mobile wallet technology, with varying degrees of success. But it may be the growing Amazon Pay, from retail giant Amazon, that is primed to make the most significant headway incorporating mobile wallet technology into the everyday lives of consumers. Not only does Amazon likely have the largest customer base of any online retailer with more than 300 million users (that’s 83% of the country’s population) but it is also one of the most trusted retail brands — both online and off. In fact, Amazon was ranked number one in customer satisfaction in the American Customer Satisfaction Index (ACSI) and number one in corporate reputation by the Harris Corporate Reputation Poll. That consumer trust can go a long way when asking them to try unfamiliar products, such as the Alexa voice-control system, or adopt new ways to buy, like using their Amazon account as a mobile wallet through Amazon Pay — just as more than 33 million Amazon users have done. Of course, if it was just a matter of customer base and a good reputation, the digital wallet may have taken off when the credit card issuers made a go at it. No, the other factors playing most heavily in Amazon’s favor when it comes to getting consumers onto the digital wallet bandwagon come down to convenience and security. To start, with the majority of consumers already in possession of an Amazon account, onboarding simply requires them to log into their account. Using Amazon Pay to make purchases is as easy as signing into your existing Amazon account. 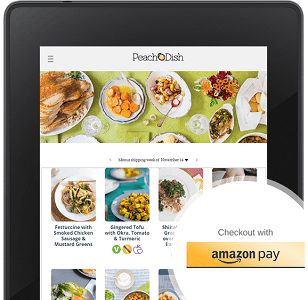 Once logged in, Amazon Pay users can access any credit card stored in their Amazon account, from any merchant site or store in which they can use Amazon Pay. That means no limitations due to issuer or bank incompatibility, as Amazon accepts all major credit cards, and cardholders can even use their Amazon Store Card or the recently launched Amazon Prime Rewards Visa Signature Card to make outside purchases through Amazon Pay. Furthermore, because of Amazon’s global reach, Amazon Pay also helps eliminate international sales hurdles and currency conversions, making it easy to buy and sell around the world. Customers from more than 170 countries used Pay with Amazon in 2016. 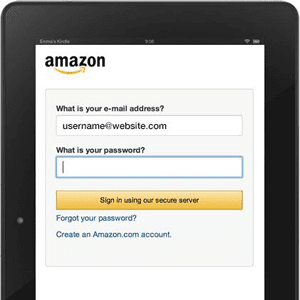 Users also get all of the security they expect from their Amazon account, with no need to enter or store any financial information with third-party merchants. Even shipping information is stored through Amazon, giving users extra peace of mind when it comes to their personal data. That peace of mind also extends to their purchase, as Amazon’s popular A-to-Z Guarantee gives users the confidence to buy without worry. “When you use Amazon Pay, you take the protection of Amazon with you. We don’t share your credit card information, and you’re covered by the same buyer protection plan available on Amazon.com,” according to the site. A February 2017 press release from Amazon revealed that the ease of use and security of Amazon Pay has led to a near doubling of payment volume in 2016. More than half of those purchases were made by Prime Members, and almost a third were made via a mobile device. Users aren’t simply making nickel-and-dime impulse buys through Amazon Pay, either. The average Pay with Amazon purchase made in 2016 totaled around $80, and the largest single transaction topped out at $40,000. Amazon Pay gives users the same safe, convenient payment experience they expect from Amazon on thousands of third-party merchant sites. “As we have introduced new experiences with merchants, we have seen a significant increase in the number of customers using the information from their Amazon account to make purchases on merchant websites,” said Patrick Gauthier, Vice President of Amazon Payments, in the same press release. Offering a bit of the best of both worlds, Amazon Pay allows merchants to take advantage of the Amazon security and fraud protection — without sacrificing customer satisfaction with a disconnected experience. Merchants can maintain their brand identity throughout a customer’s visit, on any device they use to shop. Amazon worked on extending its offline influence in 2016, as well, bringing Amazon Pay into brick-and-mortar locations. The company introduced new in-store experiences through its own Amazon Books bookstores and retailer Moda Operandi that further blur the lines between online and offline shopping. For example, Amazon Pay users can enter a physical Moda Operandi boutique and be identified by their Amazon account, via the Amazon app on their cell phone, automatically. They can then browse and shop in-store — and use Amazon Pay to complete the purchase without ever needing to swipe or sign. Though the digital wallet has taken more than two decades to secure a foothold, it is finally gaining tangible momentum in the mainstream payments space. Driven by some of the biggest names in retail and technology, including Google, Apple, Samsung, and Amazon, digital payment methods are becoming increasingly prevalent — both online and offline — as consumers strive for a secure, convenient, and connected shopping experience. Of those industry giants battling in the retail payments space, Amazon seems particularly well poised to help propel payments from plastic to digital, and put a mobile wallet in the pocket of every consumer. 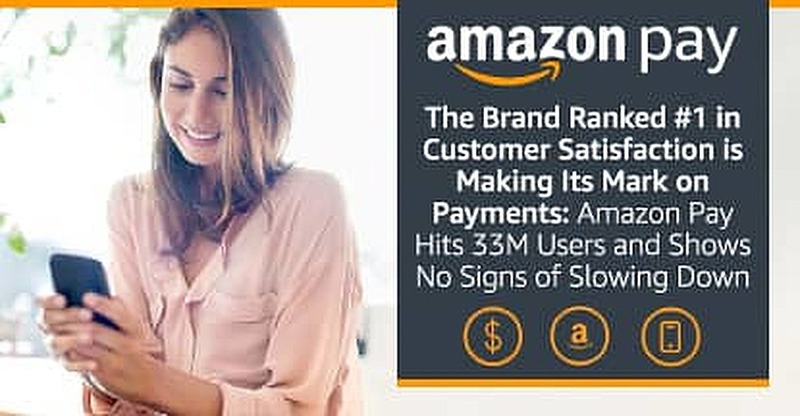 With over 33 million users already, Amazon Pay shows no sign of slowing down as the company works to turn Amazon’s hundreds of millions of existing accounts into avid Amazon Pay users — and, once again, redefine the world of retail.